Income investors should consider dividend stocks like Merck, Consolidated Edison, and Schwab US Dividend Equity ETF to keep stress at bay. Some dividend stocks don't need you to babysit them. These stocks are typically the kind of companies with proven business models that can withstand storms and continue to reward you richly. 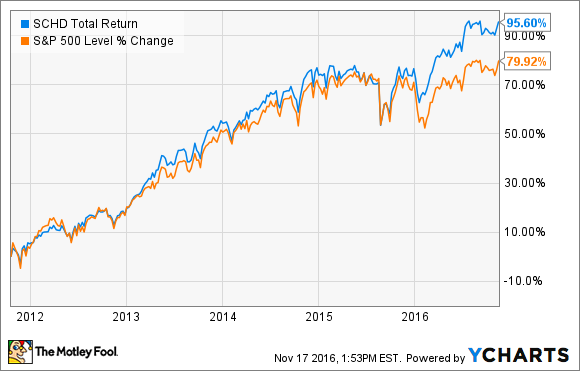 With the markets turning volatile following Donald Trump's victory, you might want to consider investing in such top-quality dividend stocks now that allow you to sleep well at night even during periods of uncertainty. We asked three of our contributors to pick one such low-risk dividend stock each. Here's why Merck & Co. (NYSE:MRK), Consolidated Edison, Inc. (NYSE:ED), and Schwab US Dividend Equity ETF (NYSEMKT:SCHD) made the list. George Budwell (Merck & Co.): Merck & Co. is arguably a classic battleground stock at the moment, but that doesn't mean income investors should flat-out avoid it. The heart of the matter is that the drugmaker is facing a parade of top-selling products like Remicade losing patent protection within the next year or so. In the same breath, though, Merck now controls the high-value non-small cell lung cancer checkpoint inhibitor market, following Keytruda's recent breakthrough in the front-line setting and the FDA green-lighting a more favorable label in the second or later-line settings. The big picture is that Keytruda now appears to have enough juice to power the drugmaker through these patent headwinds, and even keep the company's top line flat next year. While a flat top line generally doesn't inspire confidence, Merck does offer a respectable yield of 2.89%, a proven track record of increasing its annual payout, and a robust clinical pipeline. All told, Merck has a rich tradition of rewarding patient shareholders, even during the toughest times in its history. So, this dividend-paying big pharma stock shouldn't keep you awake at night if you do decide to grab some shares. This defensive dividend stock is a great choice! Neha Chamaria (Consolidated Edison): During uncertain times like these, I'd root for a dividend stock that belongs to a defensive industry where earnings are fairly stable regardless of the state of the economy. Consolidated Edison, a regulated utility that provides essentials like electricity and gas services to millions of customers, is one such stock to consider. Under the revenue decoupling mechanism, Con Ed's revenues are essentially fixed at predetermined rates and not linked to its electricity or gas sales volumes. Any differences in the actual and predetermined revenues are adjusted on the customers' accounts. In other words, Con Ed knows how much revenue it will generate in advance, eliminating volatility in its earnings. It is this stability in earnings that has allowed Con Ed to increase its dividend for 42 consecutive years. 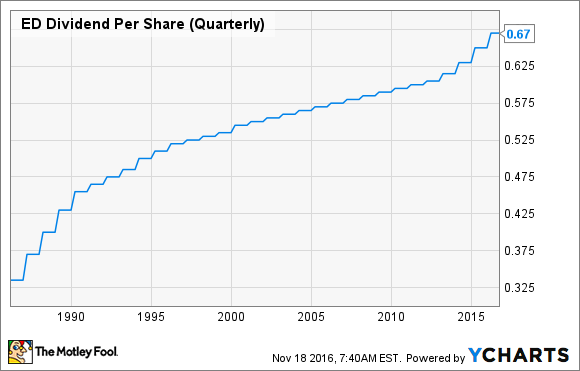 ED Dividend Per Share (Quarterly) data by YCharts. Going forward, Con Ed has outlined an aggressive multibillion-dollar program to upgrade and modernize its electricity and gas network over the next 20 years. At the same time, Con Ed is pumping billions into renewable solar and wind energy projects while tapping potential opportunities in battery storage and electric-vehicle infrastructure. I believe these investments should help Con Ed expand its customer base and boost earnings on decoupled revenues to reward you with higher dividends. With the stock down 8% in three months and offering a dividend yield of 3.8%, this is a good opportunity for income investors. Evan Niu, CFA (Schwab US Dividend Equity ETF): I'm picking of my favorite personal holdings, the Schwab US Dividend Equity ETF. Charles Schwab jumped into the proprietary ETF game many years ago, and it has continued expanding its offerings ever since. I've long been a fan of the company's ETFs, and not just because I used to work there. As a broad-based indexed ETF, the underlying portfolio is diverse and invests across a wide range of sectors, with consumer staples being the largest sector, following by tech. Since it's diversified and passively managed, you really don't have to babysit this ETF. Since it's passively managed, the expense ratio is an incredibly affordable 7 basis points. The current yield is approximately 2.7%, which may not sound like a whole lot compared to some of the other yields that are out there, but the point, here, is that the payout is extremely safe and reliable given the underlying diversified portfolio of large, mature companies. I've held this ETF for years, and it has been a consistently solid performer that requires absolutely no maintenance to follow. If you want a stock you don't have to babysit, the Schwab US Dividend Equity ETF is one to consider.